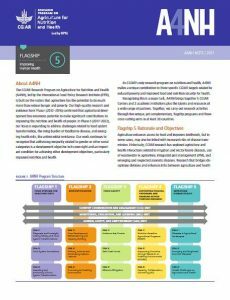 This Flagship Program is an innovative collaboration between public health and agriculture researchers aimed at mitigating health risks and optimizing benefits in agricultural systems. This flagship is led by a joint partnership arrangement co-convened by the London School of Hygiene & Tropical Medicine and the International Livestock Research Institute (ILRI), thus bridging agriculture and public health research to deliver high-quality scientific outputs and to identify new key opportunities for integrated actions that improve human health. 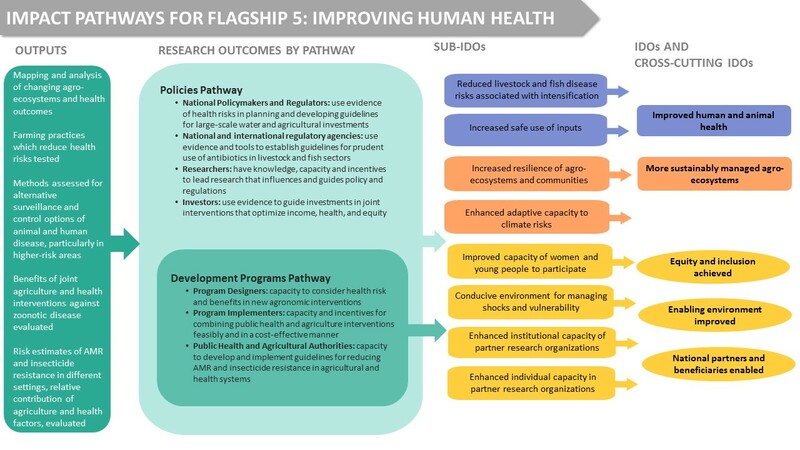 Below is a visual depicting the Flagship 5 impact pathway. CoA1: Diseases in Agricultural Landscapes concentrates on understanding the health effects of agricultural intensification, including changes in water use, so that agricultural research initiatives, including those in farming communities, are more aware of how and why it is important to measure health risks and benefits. CoA2: Emerging and Neglected Zoonotic Diseases studies shared human and animal disease risks and explores the impacts of co-locating and aligning health and agricultural interventions for effective management so that agricultural and public health policymakers and implementers deliver coordinated and effective solutions to cysticercosis, in particular, and other zoonotic threats; and public and private sector policymakers.